We slept in later than usual and lingered over our hotel’s complimentary breakfast.After our hundred miles the day before I worried that my legs and rear would rebel from cycling, but it felt surprisingly good to be on the bike again. I’ll be the first to admit, I think I’m addicted. 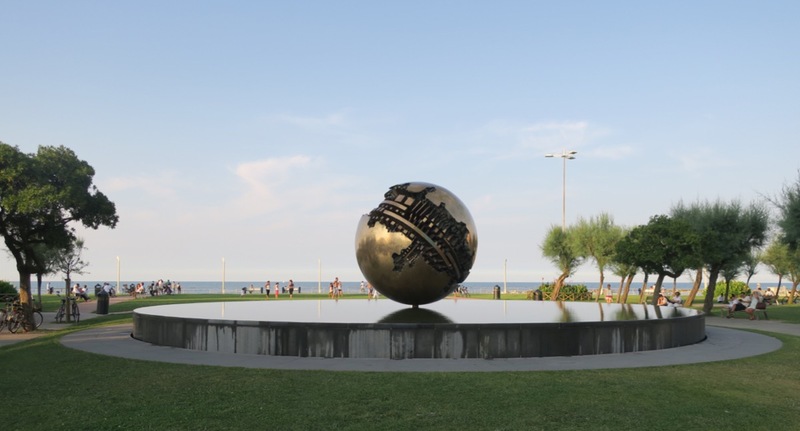 Our destination today was Pesaro, Italy. A coastal Italian city that we knew nothing about, I was looking forward to our stay because it had been a while since I had “couch surfed”. For those who don’t know, couchsurfing.com is the world’s largest online community of travelers. It connects travelers with hosts who can provide anything from a chat over coffee, to a tour of their city, to a place to crash–for free. The entire network is built upon the concept of paying it forward and helping our fellow travelers. I have always been a big supporter of the idea and have met lovely people as both a surfer and host. This would also be Bita’s first time couch surfing and I couldn’t wait to show her how awesome meeting perfect strangers can be. 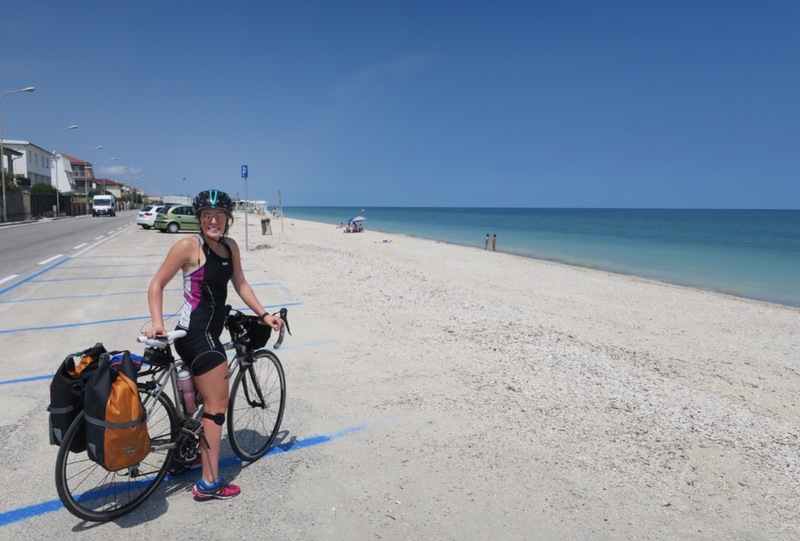 We cycled in a relaxed manner knowing we only had 40 miles to go and stopped in the town of Fano after lunch for a swim. We locked our bikes together and slowly made our way across the pebble beach. We have experienced quite a few pebble beaches on this trip; with stones ranging from large to small, rocky to slimy. These pebbles, however, were utterly perfect. Small and smooth enough to easily walk on barefoot. The water was warm and luxurious and the pebbles migrated playfully under the waves. We wished we could have stayed all day. 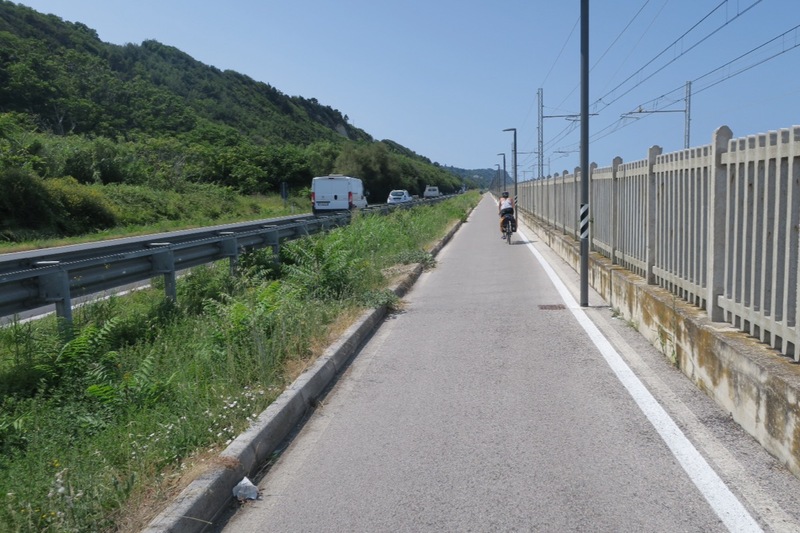 As we drew closer to Pesaro a very nice bike path appeared (we are bike path snobs and often don’t take them if they are bumpy, windy or disconnected) that we followed along the main highway. 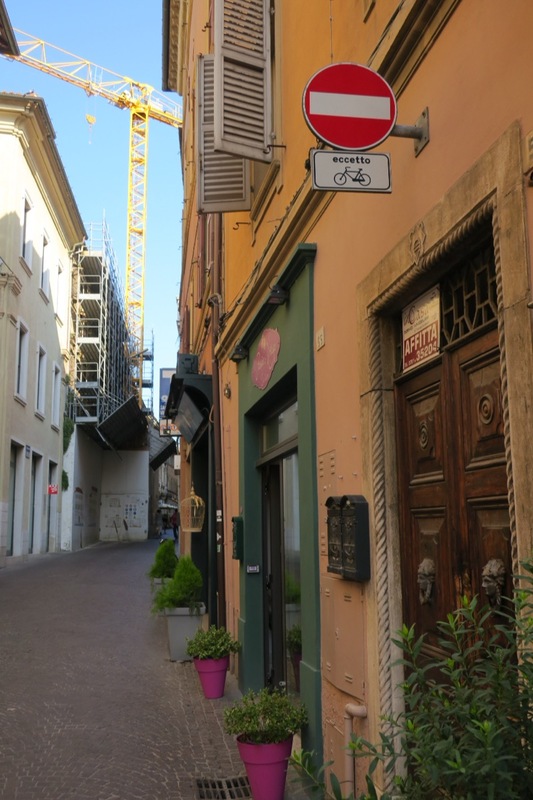 As we entered the city limits we saw the obligatory white sign that read “Pesaro” underneath which was another sign reading “Città della Bicicletta” (the city of bicycles). I loved this city already! We arrived at the home of our couch surfing host Daniele and rang his doorbell. Out came our gracious host with his curly head of hair, full beard and big smile. He welcomed us in like old friends and offered us water while we rattled on about our trip and thanked him for having us. We dropped off our things, safely stashed our bikes and headed out to explore the city, promising to return in time for a dinner with a group of his friends. 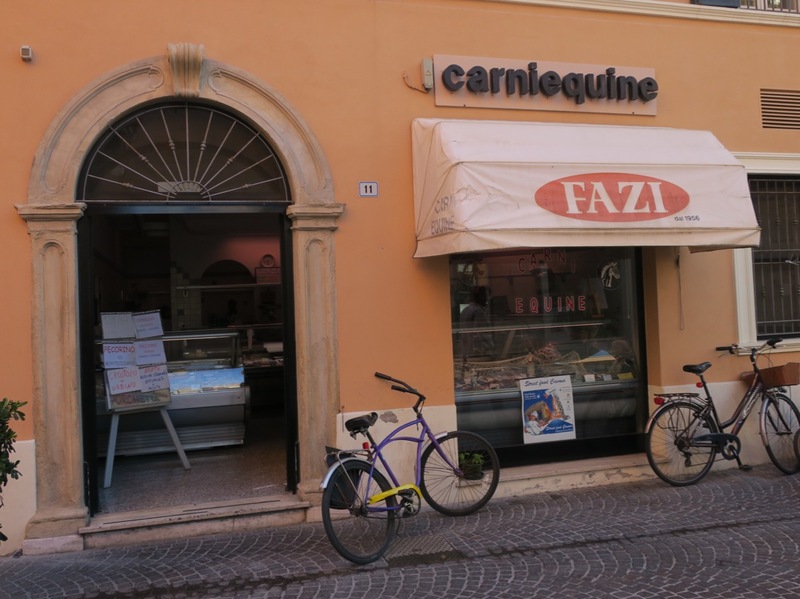 We wandered the streets of Pesaro admiring the shops and architecture. After our second gelato of the day we headed to the area along the waterfront known as Le Marche. It was joyous. Men, women and children were walking, jogging, cycling, and on the expansive green lawn a group was practicing the Brazilian art of Capoeira. Central to all this activity was the Golden Sphere Monument and reflecting pool. The setting was beautiful and very iconic Pesaro. 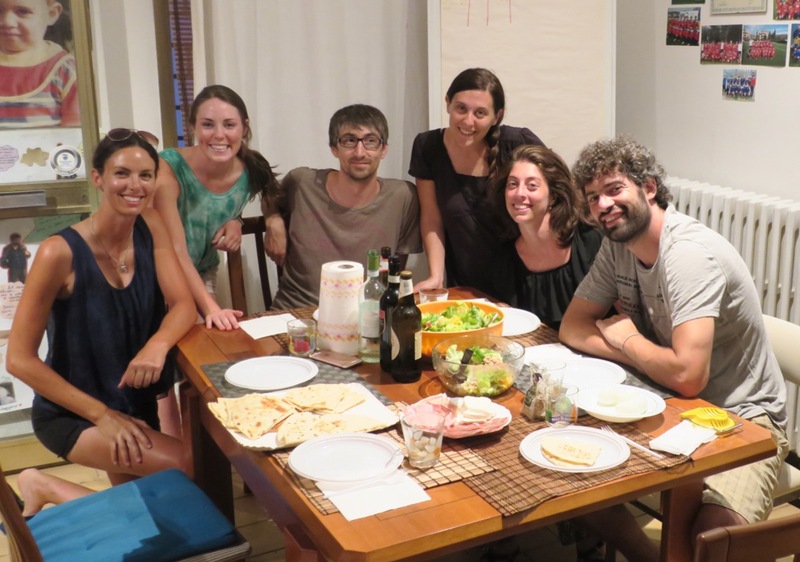 We made our way back to Daniele’s home to take part in a shared dinner. A few of his close friends joined us, and we talked about travel and life as we chopped tomatoes and washed lettuce. Daniele also told us about his experience walking the Camino de Santiago, a pilgrimage route that traverses the Northern part of Spain. I hope to take part in this journey one day. The whole group pitched in to prepare a dinner of salad and piadina, an Italian flat bread that reminded me of a slightly saltier version of Indian roti. It is delicious! Especially folded and stuffed with the salad our posse prepared. I love finding interesting foods I’ve never heard of while exploring new places. I’m definitely a foodie traveler. 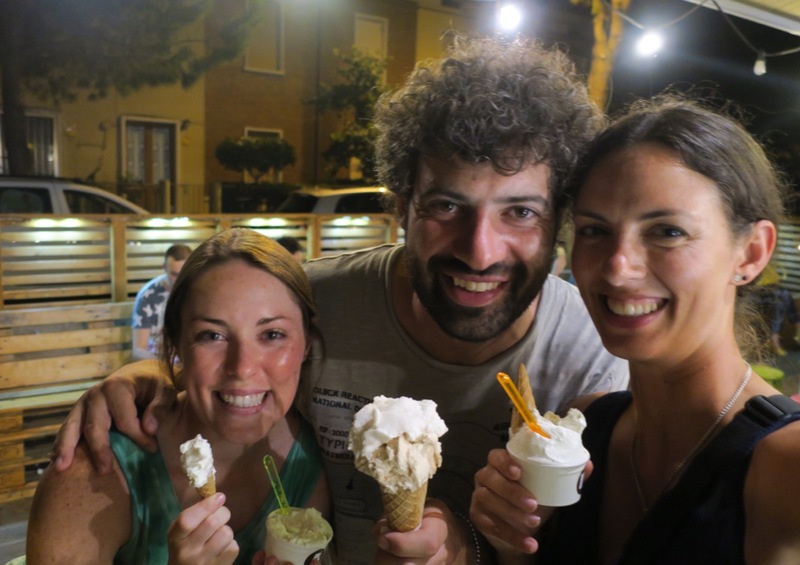 Daniele took us out and showed us the town, to include a stop for gelato. 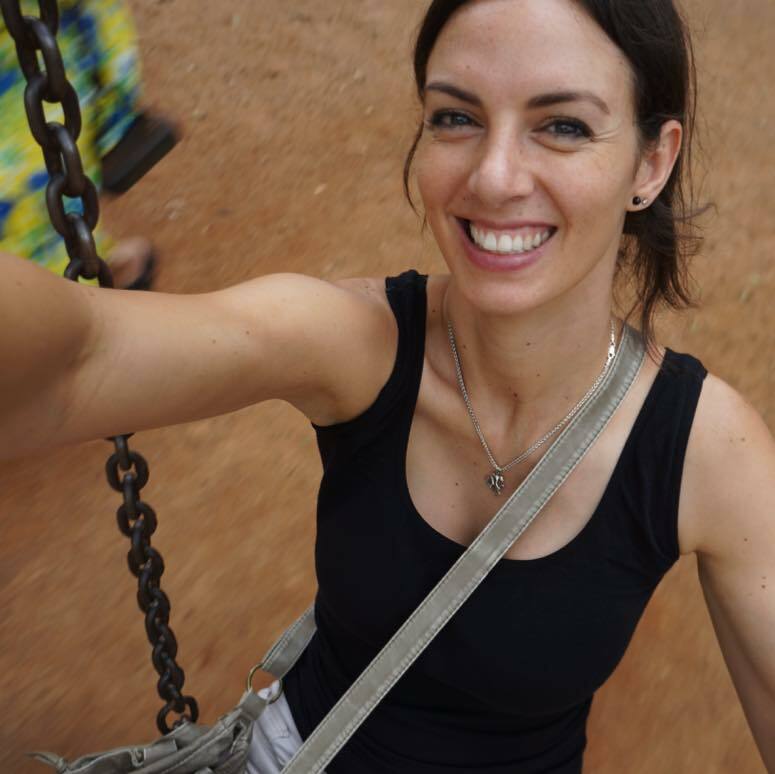 Life is good when you get to meet fellow travelers willing to show you their world and let you crash on their couch.